Soil and Dirt gets trapped in the pores of your tile and grout and causes the surface to look dirty and dark. 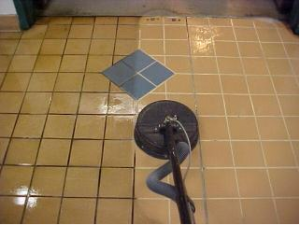 This dirty and dark look in your tile is virtually impossible to remove with traditional cleaning processes. At Professional Carpet Systems our trained Cleaning Specialists are ready to handle all of your needs….including you tile and grout problems. Professional Carpet Systems can thoroughly clean your tile and grout and make it look like is was just freshly laid. The old days of mops and toothbrushes are gone forever!! Our cleaning process flushes out more dirt than a mop and bucket ever could. 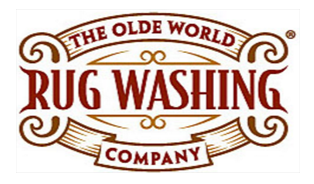 Our new technology allows us to clean your tile and grout with highly pressurized hot water with complete control and removal for the most thorough cleaning ever seen! Your floors are returned to a like-new condition. All of the dirt and grime is safely “steamed” away, leaving you free of back breaking and time consuming work. Not only can your tile and grout surfaces be returned to a like-new condition…they can also be protected to keep them looking new longer. After the cleaning process we can apply a professional application of an impregnating sealer which will leave your floors resistant to spills and stains – and so much easier to clean. Keeping your grouted surface looking cleaner longer! Let’s face it in today’s day and age we all have a million and one things to get done everyday. Let Professional Carpet Systems take one more hassle off your mind. Similar to your carpet, dirt builds up over time, dulling your tiles appearance and discoloring your grout. A professional tile and grout cleaning is the only way to remove the deep-down dirt. How often should I have my tile floor cleaned? For an average size room of 300 sq. ft. typically takes 60-90 minutes. This time can vary depending on the level of soiling. Grout is a porous material that is subject to absorbing spills and staining. Having a sealant applied will create a protective barrier that will help the floor clean easier. How long do I have to stay off of the floor? We recommend that you stay off the floor for at least 30 minutes. Vinegar and Ammonia can damage most sealers? 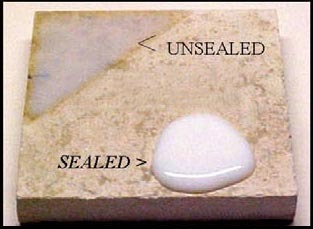 Most contractors do not seal the surfaces they install? 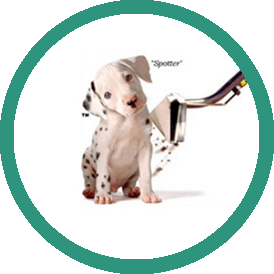 Many floor cleaning products leave a residue that can attract soil? Hard surfaces that are unsealed or sealed with poor quality sealers are a sponge for oil, food, or beverage spills which can result in permanent staining. Proper sealing and maintenance can protect your flooring investment from permanent damage by creating an invisible barrier to reduce spill penetration. More than just a price quote! A cleaning and sealing specialist will visit your home or office for a no-obligation inspection of all of your hard surfaces. We’ll inspect for damage, staining & repellency, including tests for water and oil based protection. You’ll also receive a FREE copy of ‘The Guide to Proper Hard Surface Care & Maintenance’.